Most of the search engines and web-based feed reading services will check for updates to your blog from time to time, but what if you have breaking news that you want to get out fast? You can notify ("ping") each feed reading service separately whenever you update with new content, but there's a much faster and easier way. Publish your blog's RSS feed through FeedBurner.com, and let its PingShot feature publicize those updates for you -- automatically. 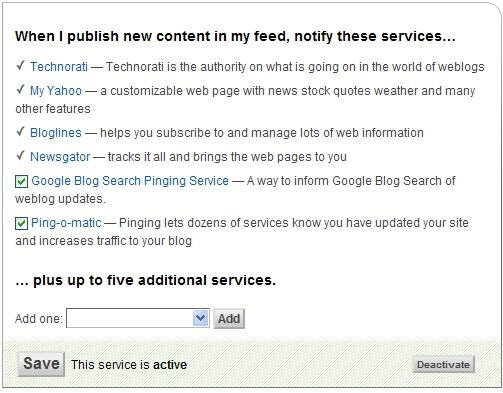 Choose the services you want to ping -- including Technorati, Bloglines, Google Blog Search, and others -- and FeedBurner will notify them when you update your blog. One of the services it will ping is Pingomatic, which in turn will notify several other major services. There are, of course, a great many feed reading and news aggregator sites on the Internet, but most simply pick up their feeds directly from FeedBurner or from one of the major services notified by PingShot. 1. Sign in to your account at FeedBurner / My Feeds, click on the title of your blog, and select the "Publicize" tab for your feed. 2. Click on "PingShot" in the left sidebar. 3. 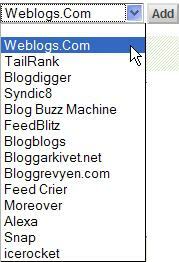 Select the services you want Feedburner to notify when you update your blog content. Click the "Activate" button, and you're done. You can go back at any time to change the options here, and simply click "Save" to record your changes. But you can also just step away and do nothing more -- let Pingshot take care of the RSS updates for you. How does FeedBurner know when your blog has new content? Once you've "burned your feed" with FeedBurner, it will automatically check for changes to your feed every 30 minutes. And if you activate the PingShot feature, FeedBurner will pass that updated information along to your selected RSS feed services automatically. Sometimes, however, you might have an urgent reason to update your feed right away -- to get out the word about breaking news, for example. If 30 minutes is too long to wait, you can always ping FeedBurner directly to tell it you've updated your content. To do this, simply go to http://www.feedburner.com/fb/a/ping and enter your website address in the space provided. After you hit the "Ping FeedBurner" button, you might want to bookmark the page. That way, the next time you want to give FeedBurner a special ping, you can do it with just one click from your bookmarks menu. For most circumstances, however, you can just get on with the business of writing your blog -- knowing that PingShot is working away in the background, helping to spread the word. I didn't know that about feed burner. Thanks for the news.